Strike a partnership with Fantastic Services and start earning big…for absolutely free. Who is our partnership suitable for? 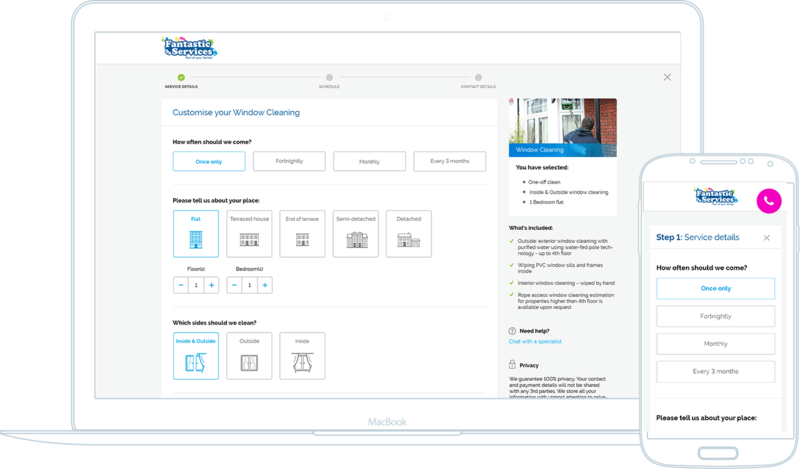 Integrate our online booking form or phone number into your most visited pages and convert all those clicks into referral fees, which you can then reinvest right back into your business. Merge it with our GoFantastic app to increase your revenue and allow your clients to benefit from top-notch services wherever they may be. Take advantage of an efficient alternative that will help you earn just as much revenue outside of Internet’s borders. Start by getting free marketing materials, such as flyers or cards. Free co-branded resources are also available. Then, simply give those to potential customers and add a few extra digits to your monthly revenue reports. Earn more without spending a dime Earn referral fees with no investment in return. You will get rewarded each time a client books our services via your website or app. Give your customers exactly what they need Join forces with Fantastic Services to satisfy your customers’ every need and give them the very best in terms of price and quality. Benefit from completely transparent tracking Keep track of every client you refer, both online & offline. Get detailed reports for every successful lead and receive your very own CRM account. You will receive a commission for every client you manage to refer. That’s right – your income will go up each time a customer books any of our services via your online or offline business. Our skilled sales operators can easily achieve a 50%+ conversion rate, thus you will turn almost every lead into a booking... and make your clients happy in the process! Answer any questions you have – Get professional advice from an experienced account manager. Running an estate agency can sometimes be hectic. When I reached out to Fantastic Services, they offered me a simple way of keeping efficient track of my business and boosting my income. Now, thanks to their flexible referral system, a simple link on my website that leads to their online booking form gives me the extra funds I need to push my business forward. My customers end up happy, too – not only do they find the fantastic place to live in, but also a range of Fantastic services to keep their dream home in tip-top shape! Three and a half years ago I started my own cleaning company alongside the regular job that I had as a consultant at a home appliances store. After one very busy and successful year, I found myself in a bit of a management crisis. And that’s where I got help from Fantastic Services. At first, they provided much needed guidance and now not only am I self-employed, but my company is also a proud Fantastic Services partner. All work is distributed and finished in time, my cleaning teams are well prepared, and they always deliver top quality cleaning. Thank you Fantastic Services for being a helpful and understanding partner. Hi, I’m a digital marketing professional. I chose to work with Fantastic Services 3.5 years ago and never regretted it. All my leads are tracked and paid properly and the set of services is well balanced, as well as their sales operatives, so customers tend to book more. Their marketing is also good, providing me with all necessary tools for attracting leads – competitive prices, deals and packages, discounts, and more. In short, Fantastic Services is the partner you want to work with! Want to learn more about our partnership options?